Yes, I have just gotten back from Hawaii, Maui to be exact, and am completely in the Aloha frame of mind. I am still mentally sipping on Mai Tais, humming “Tiny Bubbles”, and trying so very hard to keep that relaxed, casual vibe going. 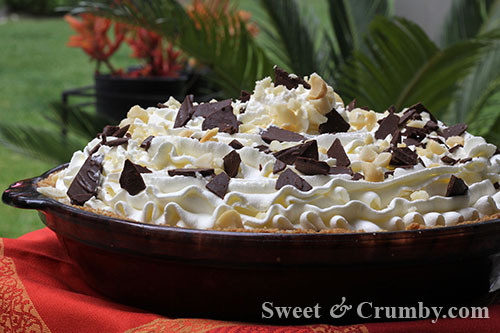 Categories: Pie | Tags: aloha, chocolate cream pie, chocolate macadamia nut pie, Hawaii, Hawaii pie, macadamia nuts, mai tai, praline crust, tropical desserts, whipped cream | Permalink.